Let me start out by saying that I get a little annoyed when people talk about their "bucket list." This is not because I object to the phrase, per se, or its implication. I understand that the 'list of stuff I want to do before I die' has been around forever - it's nothing new. But I hate that people have decided to pick up on a movie title and use it like they invented it. You didn't! So stop using it like you're clever! Jerks. At any rate, when the local comic shop was looking for help this past week, I knew I had to respond. I don't aspire to own a comic book store or anything like that, but I've always had a desire to work at one, just for a little while. I suppose that it's on my list of things to do before I kick the...well, you get it. I'm not going to kowtow to popular sentiment!!! It seems that Fanboy Comics, the shop close by in Wilmington, is moving to a new location, as I mentioned a little while ago. The move has provoked them to do some spring cleaning, which has lead to sales aplenty and a reorganization of a number of back stock items. I was lucky enough to be a part of the organization effort - not just because of the mounds of store credit I piled up, but because I can say that the list of jobs I've had in my life now includes working at a comic book store. 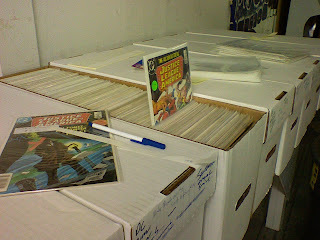 My main tasks were to organize, alphabetically and by publisher, a mountain of back issues. Afterwards there was some re-bagging and boarding. This may sound like the height of monotony, but I am nothing if not meticulous when it comes to organizing my own comics - so this was second nature from the get go. I mean, my goodness - I do this stuff at my own house, for free! Why wouldn't I jump at the chance of doing it for some form of payment? As I mentioned, I racked up a nice sized tab of store credit in this process, and I've proceeded to cut into it already. I've snagged a bunch of back issues, including nearly 40 issues of Marvel's Greatest Comics - which are reprints of old Fantastic Four issues (but I need to get anyway...I do), and some great trade paperbacks: SCUD The Disposable Assassin and Kyle Baker's Nat Turner, for starters. The capstone I'm looking forward to is the gigantic Secret Wars Omnibus, which clocks in at nearly $100. I'm gonna get it for free. Basically. A few weeks ago I mentioned receiving a letter from the US Copyright Office. As further evidence that I am not an habitual liar, I present...exhibit A.
I have a shelf copy of the Sasquatch anthology with me in NC, but the rest are back home in PA, which presented a problem...until I found a copy (at the comic shop that's having a bunch of sales) on Wednesday. I got it for five bucks, which is $20 off the cover price. I'm almost completely happy to get such a good deal on a book that I'll ultimately be giving away (TO HUMANITY), though I do have a tiny bit of remorse that I find my work so quickly selling for so cheap. I'll get over it. What wouldn't I buy for 15 cents? I'm currently living in Wilmington, NC, and for all its population growth, it continues to support only one comic book shop, so if there's a book out that I want to get (and don't want to wait for, as a shop near Pittsburgh still holds the majority of my books), I have one choice in the matter. The comic shop in question is in the process of moving a few miles away to a smaller location, and as such they are having a string of sales which does keep me hanging around to see what I can find. Recently they had a sale where you could fill up a decent-sized paper bag full of comics for ten bucks - as long as they fit in the bag, you got 'em for a total of one Alexander Hamilton. So, of course, I took part in the madness. I ended up scoring a total of 69 books, stuffing them into the bag to the breaking point, and in that total I managed to get some pretty good books - but there's only so many good books that you can find for 15-cents-or-so-per-book. If you put anyone in a room with a random assortment of comic books and said "oh, pick 70 or so", they'd invariably find some great ones, but they'd eventually run out of books that they wanted and would resort to throwing some in the bag by the end of the day. As I returned home and examined the spoils of my ten dollar adventure, I started to wonder: why would I buy a copy of Quasar #1 for ANY cost if I didn't want it in the first place? What was the POINT?! Then it dawned on me: this is, I fully believe, what is responsible for at least a quarter of all comic book purchases made. You buy it because...well, you're going to buy it! I still haven't read the damn thing. While strolling through Wal-Mart a few days ago (as I am wont to do), my eyes set upon the new DVD releases. The image you see at top represents the new movie that caught my eye. Apparently they are making anything into a movie these days, because I later found a movie about sheep eating people (seriously), too. The guy on the cover looks pretty upset, but wow, he's sure lost a lot of blood to still be able to put up a struggle at this point. Maybe it's adrenaline. The title alone allows me to discuss this movie on the blog here, but its bloody massacre-ishness reminds me of a scene from our upcoming second issue. One of the things I like about the Yeti (the comic book version, here) is that she's such a passive creature. She loves nature, she's easy going...sure, she could knock your head off if she wanted to, but by and large she's just big and fluffy. There's a flashback sequence in issue two where I originally had the Yeti bring the stranded crew a rabbit to eat...because they were, well, stranded. Duane took issue with this depiction, in part because he and his wife actually keep rabbits as pets, but also because he found it hard to believe that the Yeti could actually kill something. He was right, though it begs the question of how the Yeti survived the Himalayas without doing some hunting (the panel was eventually changed to where she brings firewood instead of an animal) at some point in her life. In any case, this is just something that jumped out at me on a stroll through the store. I don't think I'll be buying it. Actually, I don't know that ANYONE will buy it. How did this find the shelf space?